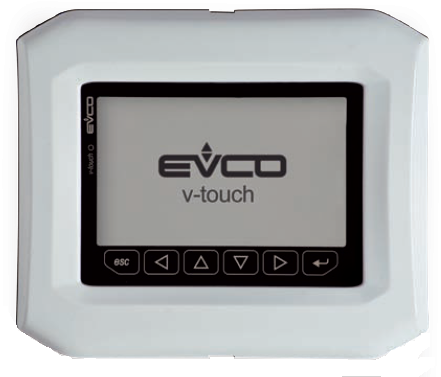 • by wall (built-in), in box like "506"
• by wall, through the support CPVW00 by Evco. colorations, white and black) and the numerous plates series "Living" and "Light" by BTicino. - wall mounting, through the support CPVW00 (to order separately). Frontal protection: IP40 (IP65 for panel mounting with gasket 0027000007, to order separately). - 24 VAC (min. 20.4 VAC, max. 27.6 VAC), 50/60 Hz, 3 VA (approximate) non isolated or 20 ... 40 VDC, 2 W (approximate) non isolated. 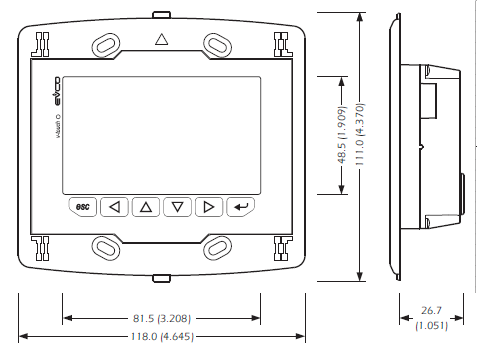 Display: 240 x 140 pixel single colour touch-screen LCD graphic display (black with backlighting through white LED).